In case you couldn’t tell from my last name, I’m not Irish. But growing up in New York City, come St. Patrick’s Day everyone is Irish. It’s fun and festive, rowdy and chaotic. I know that drinking lots of beer is a St. Patrick’s Day tradition (an entirely made up one, by the way – but who’s to argue?! ), but this weekend why not save some of that brew for your stew (watch out, I may break out into limericks at any moment…). Enter Irish Beef Stew, sometimes called Guiness Beef Stew, a hearty and delicious way to celebrate the luck of the Irish. I make no claims on authenticity here as I added in some fairly unauthentic ingredients, but the soul of the dish remains the rich Irish stout, in this case Murphy’s. For one, I added sweet potatoes instead of regular potatoes just because. For another, this entire dish became sort of an unintentional ode to radishes. 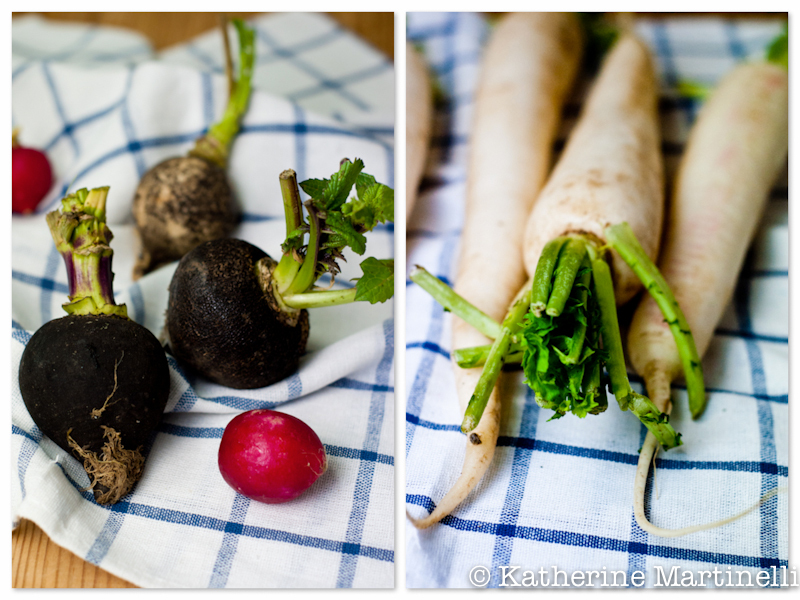 I included some black radishes, which are something of a flavor combination between turnips and normal radishes (see them in the photo below compared to traditional red breakfast radishes). And I served the stew with a very untraditional daikon radish puree. It was all delicious together, and perfect for this rainy weather we’ve been having. But, as with most stews, you can feel free to play around and add whatever veggies you have on hand. A parsnip puree would be great as well, as would more traditional mashed potatoes. This entire meal, by the way, is gluten free and (if you use margarine in the puree) kosher meat! Feel free to use any combination of root vegetables in this hearty beef stew. And if daikon radishes aren't available, make a parsnip or potato puree instead using the same method. Toss the beef in flour so that it is fully but lightly coated. Reserve any extra flour for later. Add the beef and cook, stirring, until browned on all sides. Add the onion and garlic and cook, stirring constantly, 2 minutes. Add 1 cup of the beer, beef broth, tomato paste, worcestershire sauce, and bay leaf and stir to combine, scraping up any bits from the bottom of the pot. Bring to a simmer and lower the heat. Cook, covered, for at least 2 hours. Add the potatoes and black radishes and continue to cook, uncovered, for another half an hour. Add the carrots, season with salt and pepper, and cook for half an hour. Remove the veggies and meat with a slotted spoon. Whisk together 2 tablespoons of the reserved flour from coating with a ladleful of the hot broth. Add it back into the pot and whisk to combine. Add the remaining ½ cup beer to the pot and boil until the mixture is reduced by half. Return the meat and vegetables to the pot and heat until warmed through. Serve immediately with daikon radish puree (recipe to follow). Put the daikon radishes in a large pot and cover with cold water. Bring to a boil and allow to simmer for 30 minutes, or until tender. Drain. In a blender (or in the pot using an immersion blender), puree the radishes, chicken broth, and butter or margarine until smooth. Season with salt and serve. I have been waiting for this blog hop! Your stew looks incredible, I swear I can almost smell it through the screen! And the addition of sweet potatoes? LOVE. I am so wishing I had a bowl of it in front of me right now! Yay, I’m so happy to hear that Willow! That’s why I do it every week 🙂 Thanks so much for all your sweet comments! I love that you do this every week without a list of rules to follow. And the pinterest boards, that it so great! Thank you!! Wonderful stew! Happy St. Patrick’s Day Katherine! Love the rich color of your stew. Perfect for St. Patty’s Day. Thank you for hosting Katherine! I love the look of your stew and the addition of sweet potatoes. That is a great idea and I think the flavors would go together so well. 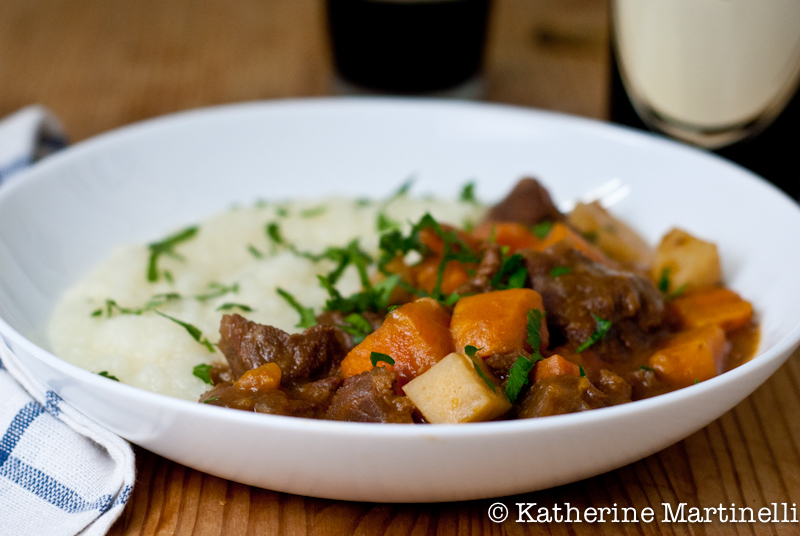 I am sharing two Guinness recipes today – Guinness Corned Beef and Guinness Beef Stew. Happy St. Patrick’s Day! Your stew looks fantastic, perfect for the tail-end of winter. I’m posting a gin cocktail that came out of an Irish neighborhood in Prohibition-era Chicago, which I’ll probably be sipping on Saturday if all the bars around here are packed. 🙂 Happy St. Patty’s Day! Thanks Diana! And thanks for linking up your cocktail – what a cool history to it! The stew looks fantastic…. I’m actually 1/4 Irish, 1/4 German and half Taiwanese talk about a weird mix. I don’t do anything to celebrate. My son goes to a Catholic school and his class leads Mass today. I always find it funny the mix of alcoholic things that pop up for St. Patricks day and the extreme opposite from the Catholic school side. 🙂 I love the sound of your Diakon puree yum. Thanks Susie! That is such a cool combo. The religious vs. drunken St. Patrick’s day is pretty funny. Thanks Carolyn! I so agree with you – sweet potatoes totally make everything better! Thanks for hosting. I wish I had found your blog last week. I had just made an amazing eggplant recipe. But this week I will post one of my not-so-healthy recipes. I mean, holidays are for fun, right?! At first it’s carrot, but you added my favorite sweet potatoes! How delicious! I love this beef stew! Happy St. Patrick’s Day! Thanks Nami!! How I love carrots and sweet potatoes 🙂 I hope you had a great weekend! Hi Katherine =)) This sounds wonderful! Very hearty and full-flavored, nom nom! Thanks for sharing and have a wonderful weekend! Yes I would love your irish beef stew with massh potatoe, sounds like a complete food for my tummy. Beer gives an nice flavoure to dishes, I am wondering though what it tastes like with radish or turnips. I just know the little pinkish radish which we eat uncooked with salt in europe. Happy St.patricks day by the way. Its a unknown clebration to us in middle europe and in india even more, so I have not experienced a real st.patricks day. I heard that lots of irish live in New York. Thats so cool that u grew up there. As kid I used to wish that I we would be living in New York. It always sounded so exciting to me the big apple. Have a nice weekend Katherine! Sweet mash up with the puree! Pretty awesome combo 🙂 I hope you’re having a fabulous St. Paddy’s! 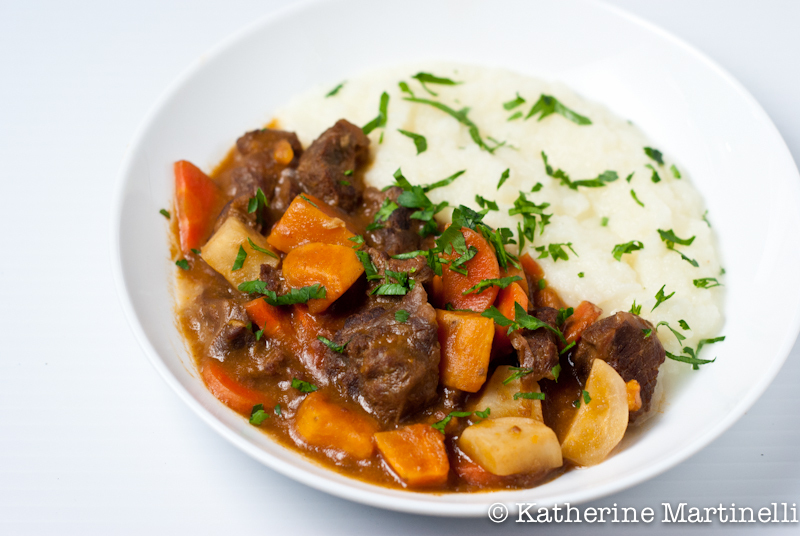 Your stew is a nice twist from the traditional with the addition of sweet potatoes and turnip. Happy St. Patrick’s Day! You stew sounds wonderful, but I have to admit that the daikon puree’ has me intrigued. What a creative and tasty, tasty stew! Hope you’re having a great St. Patty’s Day and thanks for hosting! Thanks MJ!! I have to say the daikon radish puree was just delicious. I’d never had it that way before but I was thinking of parsnip puree, and they look so similar, I figured why not. It just worked! I want some black radishes!! Really love them. I was so excited to see them! I actually hadn’t had them before and to be honest wasn’t sure what they were at first. But google translate helped me figure it out from Hebrew 🙂 And I was so pleased with how the daikon radish puree came out! I love all the variety in this recipe. I’ve only seen and used the daikon radishes once before and had never thought to mash them like you did. Thanks Mary! I’d never had daikon radishes mashed/pureed before but it worked out beautifully. Since I am huge beef stew lover this one could be one of my favorites. Your photographs are so beautiful and making my mouth water! Great recipe! Have a wonderful weekend sweetie! Aw thanks Sandra!! I also love a good beef stew – who doesn’t?! Hope your weekend was wonderful as well. Thanks Raymund! This would be great with rice as well, good idea! I really like this stew, mainly because you have a good balance of veggies in here and also that I like the choice of veggie. It looks delicious and very much an authentic Irish stew. Very creative side dish-I will need need to try. Pureed Radish would be a great alternative for mashed potatoes. Thanks Tina! I always try to pack in as many veggies as I can in things like this 🙂 The pureed daikon radish definitely makes a great, lower carb alternative to mashed potatoes! Thank you Lorraine!! I love that it’s fall on the other side of the world. This would be perfect with some soda bread. I’m loving this — sweet potatoes and radish? Not a flavor combo I often use, but sounds terrific. I’ve never heard of black radishes — I’ve got some catching up to do! Regarding traditional Irish food, drink, etc., I’m not sure if there’s anything truly “authentic.” But it’s fun to pretend! Good post — thanks. Thanks! The black radishes are really almost like turnips, but with a bit of radish-like bite. Perfect for stew. Haha thanks 🙂 It’s definitely a wild time!